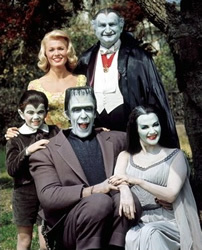 Performers include: Fred Gwynne, Al Lewis, Yvonne De Carlo, Butch Patrick, Pat Priest, Beverley Owen, and Bob Hastings. A normal, all-American family that just happen to be monsters. Patriarch Herman Munster (Fred Gwynne) is a Frankenstein-like monster and a very strong but good-natured buffoon. He is married to female vampire Lily (Yvonne De Carlo) and they are the parents of young werewolf Eddie (Butch Patrick). Lily’s teenage niece, Marilyn (Beverly Ownen, later Pat Priest), also lives with the family and they are often ashamed of her pretty and unghoulish appearance. Lily’s inventor father, “Grandpa” Sam Dracula, rounds out the family and frequently argues with his dim-witted son-in-law. The family’s pets include fire-breathing dragon Spot, Grandpa’s bat Igor, talking raven Charlie (Mel Blanc), and piranha-like goldfish.